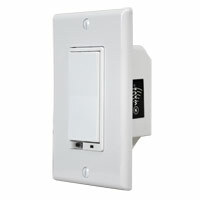 The Wireless Z-Wave wall mount dimmer allows remote ON/OFF control and dimming of connected lights. The smart dimmer switch is easily wired in place of a standard wall dimmer, and requires a Neutral connection. The WD1000Z-1 dimmer has a field replaceable trim ring – the color of the device can be altered with the Trim ring kit model in black, brown, and almond. Note to Installers: When installing a Z-Wave 3-Way Light setup utilizing Nortek Security & Control products, you will need a Load Bearing switch (WS15Z-1, WD500Z-1 or WD1000Z-1) and a non-load bearing WT00Z-1. Multiple WT00Z-1 switches can be utilized to control multiple Load Bearing devices. Please refer to the linked Technical Bulletin on Z-Wave 3-Way Light Switch Setup for more information.